We are proud to present the Cuba 503 Hi-Fi Furniture Range which features hardwood supports manufactured from 75mm real walnut and Oak, complimenting the homes of our customers. All of our solid hardwoods are sourced from fully licenced, professionally managed forests. Thanks to techniques of sustained yield forest management more hardwoods have been grown in the past 30 years than have been harvested. 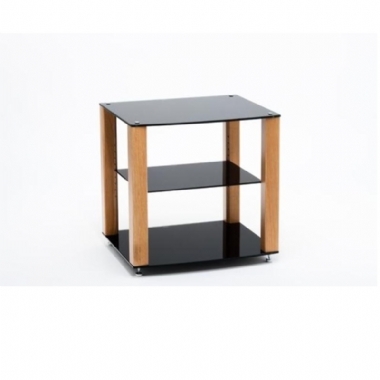 The 8mm and 6mm Clear or Black glass shelves are manufactured to EN 12105-02 with polished edges and designed support 30kg on the top and base shelf and 20kg on the adjustable shelves.